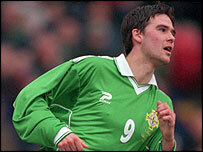 Preston's David Healy became Northern Ireland's top international scorer with 14 goals he netted in either half of their 3-0 win over Trinidad and Tobago. It took only four minutes for Healy to claim his first, a 40-yard free-kick, after he himself had been fouled. Maik Taylor made a superb save to deny Stern John an equaliser before Stuart Elliott made it 2-0, burying Healy's right-wing cross from close range. Healy wrapped up the win when he shot home after a poorly-cleared corner. Going 3-0 down prompted the home side to bring on Dwight Yorke, who had been personally requested to take part in the game by the Islands' Prime Minister. But the Blackburn striker had no luck getting past a stout Northern Ireland defence, as Lawrie Sanchez's men made it three games unbeaten on their Caribbean tour. Linfield goalkeeper Alan Mannus made his international debut, replacing Maik Taylor eight minutes from the end. Trinidad and Tobago: Ince, Eve, Sancho, Cox, Andrews, Rougier, Boucaud, Jemmot, Mason, Edwards, John.